A little over a year ago, I posted a two part article about integrating Firebase Cloud Messaging in your Delphi mobile apps. This time, it’s a single part article because much of the work is done for you, or is simplified. The code in this article was built and tested using an install of the latest Delphi 10.2.3 (build 25.0.31059.3231), and at least for iOS, will require specifically this version. For Android you may be able to make it work in Delphi 10.1 Berlin or earlier. There have been quite a number of releases since the original article, which used version 10.2.1 of the Firebase Android SDK, and version 4.3.0 of the Firebase iOS SDK. This article uses the latest released SDKs: the Firebase Messaging Android library is numbered 17.1.0 (libraries that it depends on have lower numbers) and the Firebase iOS SDK is at 5.5.0. In the previous articles, it was up to the reader to download and extract the SDKs using the tools described in the articles. This time, I have uploaded the bare minimum libraries to the KastriFree project so that the demo project should just compile and run, after supplying a couple of files of your own. Due to changes in the SDKs, the supporting code has also changed. This means that the older demo will probably not compile, and will certainly not work using the older SDKs. Some may have noticed that notifications (both local and remote) are not working as expected in later versions of iOS. In this solution, the device will display a push notification when the app is not running, when the app is in the background, and when in the foreground. This is because it makes use of the later APIs, including UNUserNotificationCenter which allows notifications to show in the foreground. Similarly, if on Android you are targeting API 26 or greater (which is a requirement for Google Play apps), you may have noticed that both local and remote notifications do not show at all. This is due to the API 26 requirement of the use of notification channels. The FCM support in this solution makes use of these, so your notifications will show. This solution also makes use of TPermissionsRequester introduced in an article regarding targeting API 26 or greater, to demonstrate requesting “dangerous” permissions. The permissions being requested here are not actually required for this demo, so as per the comments in the code, you may remove the references to TPermissionsRequester if you do not require it. There is a known issue with linking to the Firebase iOS SDK when targeting some versions of the iOS SDK, namely iOS SDK 11.3 or later. It has also been reported that this is sometimes an issue with iOS 11.2 SDK, however it is not always the case. Hopefully this issue will be resolved in the next release of Delphi. As per the introduction above, much of the work this time has already been done for you. However there are two important aspects that you will need to take care of before the demo will work. In part 1 of the original article, once you have set up your Firebase Console project (for each platform you require), you will need to download google-services.json from the Android section, and GoogleService-info.plist from the iOS section. and save the modified strings.template.xml as strings.xml, to the Resources folder of the demo. As per the intro, the demo is here, and remember that it relies on files from KastriFree. [DCC Error] DW.Firebase.InstanceId.Android.pas (67): E2003 Undeclared identifier: ‘TJDWFirebaseInstanceIdService’. Can you tell me what I must be forgetting? If you’re compiling the latest demo as per the article, you should not be receiving that error at all. If you’re compiling an older project, make sure you remove DW.Firebase.InstanceId from any uses clauses; it is no longer required. Hi Dave! On older version I can listen TokenRefresh by DW.Firebase.InstanceId. If isn’t longer required, Can I use TFirebaseMessaging.OnTokenReceived for RefreshedToken too? Firstly, thanks for the post that has helped the whole community. Congratulations on the excellent work, sharing knowledge. What platform is this on? How are you sending the message, and what is the payload? The problem occurs in Android 8.0. I am sending a test message from the Firebase console. Here is the payload I get when the app is open. I’m just sending a message titled “Test” and the content “Test” through the Firebase console. By sending following the steps of section 10 the same problem occurs. I read something about a similar problem, in which I would like to add the strings.xml file to the line ” default ” but I did not succeed. If you send the same message to a device with android 6, it works normally. This is the feedback I have made through the method. However, you may wish to check that your strings.xml (which you should have in the Resources folder in the demo) has the correct values. Also, check that the Libraries under the Android platform in Project Manager match the last image in the article. The problem persists even by updating the dw-firebase.jar file. I do not know if it has anything to do but when the application is open and receives the notification, the notification icon comes completely blank. The application icon does not appear. This only happens on Android 8. Previous versions of Android work perfectly. I’ll keep trying. If so, put it in the comments. Hi, Dave. This is the monitor log. Do you have any tips that can help me? 09-04 19:55:07.610: W/FirebaseMessaging(13070): Notification Channel set in AndroidManifest.xml has not been created by the app. Default value will be used. The only exception I have is that if I disable google-analytics-v2.dex.jar my application hangs at startup. Apparently Samsung are rolling out 8.1 this month? Same problem on Android 8. First of all, thanks for the post. Did you follow this post? Are you referring to the part about updating from an older project? I discovered that it should be fairly straightforward: for Android, you just need to remove the jars that no longer apply, and add those that do apply – they’re all in the (bdsdir)\lib\android\Debug folder. Use the picture at the end of the article as a reference. For iOS, there should be no changes. thanks for this post! I have a strange error. After compiling the project, I get the error message saying that there is no android-device to deploy. Other projects work normally, but your project doesn’t. I tried on 10.1 and 10.2 … same on both. Can this be the reason because all libraries which end with 7.0.0.dex.jar are not available and marked with an “x” … i tried to get the files somewhere, but with no luck. The .jar files are available in Delphi 10.2.3, so if you have 10.2.2 or earlier it would require some “tweaking” to make it work. I don’t think the message you are seeing is related though; it means it thinks you have no device connected. The message itself doesn’t show up. 1.) the app doesn’t wake up when it is in background and a notification arrives. The app isn’t supposed to “wake up” when it is in the background, however the Firebase message service is supposed to present a notification to Android which should show up on the screen. I suggest using Monitor (as per section 10 in the original article) to check the logcat messages to see whether there are any errors or other messages that may indicate what the problem is. 09-04 22:47:21.636: D/FirebaseApp(3487): com.google.firebase.auth.FirebaseAuth is not linked. Skipping initialization. 09-04 22:47:21.637: D/FirebaseApp(3487): com.google.firebase.crash.FirebaseCrash is not linked. Skipping initialization. 09-04 22:47:21.638: D/FirebaseApp(3487): com.google.android.gms.measurement.AppMeasurement is not linked. Skipping initialization. Was the app in the background when this message was sent? It looks like it was being received, hence the “TPlatformFirebaseMessaging.HandleMessageReceived” entries. B.t.w. the link in section 10 (Hurl website) doesn’t work, so I wrote a small application for posting the data. But since I have to enter the token in the “to” section of the json data part, do you know if this token changes sometimes? If this token changes regularly, the service would be useless because the “sender application” must be updated over and over?!? Which is far less convenient than HURL was. I have a tool of my own that I use for testing that I may make available publicly. To answer your question about the token: it should not change during the life of the application (it will definitely change on an uninstall/reinstall of the app), however you must be prepared for when it does. To this end, it is wise to keep track of the value (i.e. store it on the device), and notify your back end (i.e. a webserver) where you manage sending of messages from, of the change. Good idea to keep track of the token and update the server. Hi Dave! I’m still looking for a solution for Android 8.0. If the application is in the foreground the notification arrives, but if it is not in the background. This is the log I get from the monitor as shown in section 10 of the first article. did you manage to find any fix for this problem ? your application works very well. I would like to know if it is possible to send an upstream message from your client application to a server application. via firebase. Hello and thank you for your code. I am running Delphi 10.2.3 and a Samsung S8+ v 8.0.0. When I run the FCM Revisited I just get profile=0 in the FCM Messages memo. Can you point me in the right direction? Are you seeing a token in the memo with the “Your device token” heading? 09-09 18:34:23.429: W/FirebaseMessaging(23574): Missing Default Notification Channel metadata in AndroidManifest. Default value will be used. Fernando (in the comments) is having the same problem. He also has a device with Android 8.0, so perhaps that has something to do with it. Otherwise, can you check the Libraries node under the Android platform in Project Manager to ensure that it looks like the last image in this article? Also, perhaps delete the Android folder where the compiler outputs to, and do a Clean and Build. Thank you! My Libraries look identical to the image in the above post. I have done a clean build and deleted the aforementioned folder. The result…Same outcome. I also wanted to ask what’s the earliest version of Delphi the Kastri Library will work with? I’m assuming for the moment that it’s an Android 8.0 specific issue, however: are you using the demo project, or one of your own? If the former, are you able to build an .apk and put it somewhere that I can download/test it from? Dave! Your tool worked like a charm. Thank you! I am able to receive the incoming Push Notifications when the app is opened as well as closed on my Samsung S8+ on Android 8.0.0. (For the benefit of others SENT FROM FIREBASE SEND TOOL THIS IS NOT FUNCTIONAL). Hi Mike, i am facing the same problem currently. Can i know how you resolved it? I’m trying to get the FCM Revisited demo working but having difficulty with it. I’m using iOS (11.4.1). I’ve set up everything correctly as far as I can tell. I’m using one of my existing App bundle ID’s which I have set up for push notifications. The issue I have is that notifications are not being displayed either when the app is running, in the background or closed. However, when the app is open, I do see that the payload is received in the memo on the screen. I am sending the payload through the FireBase remote message testing feature from the Firebase Console. I’ve also tested with PostMan which gives the same result. I did notice that the app doesn’t request notification permission from the user (as iOS requires) so I assume this would prevent any notifications being displayed. To try and fix this, I added a TNotificationCenter component to the form so that the “Request Push Notifications” prompt displays when it is first run (and the notification settings are displayed in the app settings). However, even when selecting “Allow” for push notifications, I’m still not receiving any visual notification on the screen (except for the JSON in the memo when the app is running). The communication from server (firebase console) to device is clearly working correctly as the JSON is being delivered, but it doesn’t seem to be triggering the notification on the device itself. Do you have any ideas as to what may be preventing this from working? They should work. Otherwise, I’m in the process of preparing for release a tool that I use for sending messages.. stay tuned! Thanks Dave, I’ll give this a go. Any ideas about the “Permission Request” not showing to allow push notifications? This prompt shows immediately on startup of your “local notifications” demo, but it doesn’t show on the “FCM Revisited” demo. Any ideas? I assume the user would need to see this and select “Allow” before any notifications would show. Ok, I may have found a cause of the problem I’m having here. I found a previous DW.iOSapi.Helpers.pas in a different folder on my search path. Will test again and let you know how it goes. Hello. While you are waiting for Dave to respond, you may want to try the advanced option when sending from the FCM console. In my travels, I read that unless you drop down the Advanced Options and Add some Custom Data, your message isn’t sent properly or rather the way you need it sent. I have not verified this yet. Thanks Mike, tried this but no change. Going to test with hUrl as Dave suggests. Thanks again! HI, I’ve had the same kind of problem (on iOS no notification when app was inactive/background but worked when app was active). Using the iOS-console on my OSX (suggested in the prev article) I’ve discovered a message which pointed out that something with the provision-profile was wrong (no valid aps environment entitlement string at app-startup) because I was using a development profile with a wildcard-appID. So check out the (development) provision profile (regenerate and download,install). Using Delphi 10.2.3 (or apply all 10.2.2 patches). My apologies! Dave already responded. Just offering something in case you were idle. The demo project is working for me, but when I try to integrate the solution in my own app I get an error on runtime (iOS x64). The error is ‘ObjectiveC class FIRMessaging not found’. Do you have any hint how to solve this? The Firebase framework-directories are in the project browse-path. Thanks a lot Dave, this solved it! Hey Dave… Just curious… Should this work in the OSX Xcode iOS Simulator or do I need to be publishing to an actual device as there is no -ObjC option for the simulator? Hey Dave! Since I got the Demo app to receive FCM Push messages, I’ve tried to add the functionality to a stub of my application (a skeleton version of my GUI with no significant code). As soon as the app loads on Android it goes out of memory. Not output to Android device monitor as it terminates so quickly. I am thinking I may be missing some deployment necessities. Your sample app seems to include a ton of items and I am unsure what I need to manually deploy. I am including the customized strings.xml created from the Google JSON file and in the IDE, under Project Manager>Android>Libraries I have made all inclusions and omissions to clone that of your project. Can you push me in the right direction? 09-13 11:04:42.009: W/System.err(10822): java.lang.IllegalStateException: Default FirebaseApp is not initialized in this process com.edgevcorp.ClubIOMobile. Make sure to call FirebaseApp.initializeApp(Context) first. For step 7 use your strings.xml file and the /res folder located in ThirdParty/PlayServices/Android from the KastriFree project. As for step 8 seems like you need to include in your AndroidManifest.template.xml file some chunks from the same file in the FCM Revisited demo project that are not enclosed inside **** FCM **** comments. Check carefully and you will find them. Thank you! I’ll bang at it. it works great with android. Thank you very much for sharing this excellent work. It’s helped me a lot. What could I do to receive messages even if the user is in another (not main) form? Is there any way to send silent notification, aka data only, without showing the notification to android? Since in the past, data is the only section, no notification will be displayed. For the time being, if I send a Data Message, there will be an empty notification shown in the system tray. Data Message: this type has the behavior you described above. Client app is responsible for processing data messages. Data messages have only custom key-value pairs. As per Robbert’s question, it would require a change to the Java code that resides in dw-firebase.jar. I may look at supporting this later. For silent push notifications on Android, the solution may be a bit more challenging because a notification may be received when the app is not running. The only way to execute Delphi code in that scenario is to have the messaging service descendant (which is in the Java code) either launch the Delphi application, or start a service that you’ve done in Delphi code, that is associated with your application. Obviously if your app starts it’s not very “silent”, so it would need to be a service. This presents a new problem: for the service types that are supported (and actually work) in Delphi, the service would need to be started in the foreground (due to background execution restrictions on API 26 or greater), which requires a notification that the user will see, so once again, not “silent”. It might be possible to use an IntentService, however presently these do not work properly in the current version of Delphi. Thanks Dave. Your code is great. I like to create two android channels for my app (“NewsItem” and “MatchResult”). How do I create channels in my app with your solution? ..which would then require a rebuild of the dw-firebase.jar file. I am planning on publishing an article about how to change the Java sources and rebuild the jars, however due to other commitments it may be another month or so away. great work and nice explanation to get easily Firebase-Notification implemented in our project. Actually we face the problem that on older Android versions / Devices we get the error that the default FirebaseApp is not initialized. 10-30 10:56:05.415: W/System.err(9554): java.lang.IllegalStateException: Default FirebaseApp is not initialized in this process xxxx. Make sure to call FirebaseApp.initializeApp(Context) first. So i don’t think that there is a general mistake in our project (putting strings.xml wrong or something). Or i couldn’t found it out yet. I think that this issue is well known but i didn’t get it how to transfer this to Delphi. And if this resolves the problem because FirebaseInitProvider should initialize Default FirebaseApp and it does but is not succesfully – is there some more details what cause this? The FCMREvisited demo worked fine! But when I implement TFirebaseMessaging in my own project and run on a Android 8.0 device, I also get W/System.err(28157): java.lang.IllegalStateException: Default FirebaseApp is not initialized in this process com.rjm.myapp. Make sure to call FirebaseApp.initializeApp(Context) first. I’ve made the two changes in DW.Firebase.Messaging.Android as you suggested and this indeed solved the problem!!! I receive the device token in my app now. BTW Not sure why the demo did not have this issue. Will you commit this fix of DW.Firebase.Messaging.Android in the KastriFreeLib? I’m wondering, in the FCMRevisited demo project, why is first asked for location, camera and external storage permission? Why is this needed for notifications? Can I just only ask for permission for notifications (FFCM.RequestAuthorization)? I’m actually not sure why I added requesting those permissions in the app! I expect I had a good reason; perhaps it was to demonstrate requesting permissions because this revisited demo is targeting API 26+? I’ll update the article and code to indicate that the permissions are not actually required for notifications; thanks! Hi Dave, I am currently facing problem with Push Notification on Android O.
I am having exactly same error like Fernando and Mike. To further clarify, I just cloned the whole repo, added the strings.xml then run the demo. The message was sent using own server application. from AndroidManifest.template.xml? I think it was commented out because it was apparently not needed. Hi Dave, thank you for replying. The problem still persists with same error no matter that line is commented or not. Will this problem related to sdk version? – In the manifest template of FCMRevisited demo android:debuggable=”%debuggable%” will be generated as android:debuggable=”true” (which is needed to see the package name in Android Device Monitor). In my own app however it is generated as android:debuggable=”false”. Which project option is responsible for this value? – In my own app the build process adds to the generated manifest (it is not in the template). Which project setting is responsible for this. I guess with the KastriFree solution for FCM this receiver is not needed anymore. I carefully compared all project options of the FCMRevisited demo with those of my own project, but I can not find any differences. is added. Which project setting is responsible for this? For the notification receiver, it’s the Receive push notifications option in the Entitlement List. Do not check this option if you’re using my FCM solution. It means the compiler is finding the source for the iOSapi.StoreKit unit, and is attempting to compile DW.iOSapi.Firebase for it, but does not find a matching iOSapi.UIKit. i.e. You have the source for iOSapi.StoreKit unit somewhere in the compiler path but not the source for iOSapi.UIKit (i.e. the compiler finds a compiled .DCU instead). Thanks for your response. It appeared to be caused by Alcinoe library (which I use for double buffered controls). But this was solved after putting iOSapi.StoreKit.pas, System.iOS.Sensors.pas (with an added implementation for DidVisit) and iOSapi.CoreMotion.pas in the project’s search path. After that it appeared also to be needed to add framework IOSurface (I’ve somehow missed it), and to put the 10 Firebase.5.5.0 frameworks in the search path (maybe group them in one directory?). Now I was able to build my app for iOS (SDK 11.2) and deploy it. Below the iOS crash report, I can not make much of it. It might help to use the Console app (on the Mac in Applications/Utilities) to see what messages (especially errors) related to the app show up in there. Hi, unfortunately I don’t own a MAC. I use MacinCloud to deploy my ipa and to deliver it to iTunes Connect. I then test my app on my iPad using TestFlight. All I have is the crash report of my iPad which I partly included in my last post. Yes, I’m afraid so. I will dive deeper in it when I have more time. But for now, for iOS, I wil stick with System.PushNotification.TPushServiceConnection/FMX.PushNotification.iOS; it still works fine for me. For Android I used to use System.PushNotification.TPushServiceConnection/FMX.PushNotification.Android, but that appeared to be broken for targetSDK 26. However your KastriFree solution for Android proofed to be a perfect replacement! [Exec Error] de opdracht PATH … & “C:\Users\Public\Documents\Embarcadero\Studio\19.0\CatalogRepository\AndroidSDK-2433_19.0.29899.2631\build-tools\22.0.1\dx.bat” –dex –output=”C:\Users\UserXXX\Projecten\KastriFreeLib\Demos\Notifications\Android\Debug\dw-multireceiver-dexed.jar” “C:\Users\UserXXX\Projecten\KastriFreeLib\Lib\dw-multireceiver.jar” is afgesloten met code 1. (I replaced the path with …, because it is very long, and the error is partly in Dutch but its saying something like: “the command PATH …… has been closed with code 1”. Any idea? It probably has to do something with dw-multireceiver.jar, because when I add this library to my main project, I get the same error. Hello Dave, congratulations on your work. “com.embarcadero.delphiteste” is the name of my app. ..and see what happens? Someone else had a similar issue, and I noticed this change had not been checked in. Dave compiled, but did not display the token in the app. 11-09 20:54:10.525: D/FirebaseApp(8935): com.google.firebase.auth.FirebaseAuth is not linked. Skipping initialization. 11-09 20:54:10.525: D/FirebaseApp(8935): com.google.firebase.crash.FirebaseCrash is not linked. Skipping initialization. 11-09 20:54:10.525: D/FirebaseApp(8935): com.google.android.gms.measurement.AppMeasurement is not linked. Skipping initialization. The function AResults.AreAllGranted result false, dont run FFCM.RequestAuthorization in line 86 (MainFrm.pas). So that it does not request permissions, as they’re really only optional in this demo. If you update that file, can you let me know whether the FCMAuthorizationResultHandler method is called, and whether FFCM.Connect is called? The initialization error was due to an incorrect character in the strings.xml file. I’m going to test on iOS now. Congratulations on your code and thank you very much for your attention. Dave, the FFCM.Connect function is called, displays the port number in the app, but does not call the function to get the Token number. I will test on another computer with another install of Delphi and then I’ll give you the result, it was supposed to have worked. I am with a new computer and with a new Delphi installation. I downloaded the demo and changed the DW.Firebase.Messaging.Android.pas file as you passed. I am testing on another computer with another Delphi installation, as I did several tests with examples and components and I may have compromised the default configuration. On Android everything worked out, now I’m testing on iOS. In the demo (FCMRevisited) that I’m testing, you already have the Firebase SDK files. Thanks for the answers, you’re helping me a lot. I do not have iOS 11.3 SDK installed because it does not run in Delphi. I will install it on another computer and copy the ImageIO.framework file. He also asked for the IOSurface framework, I did the same procedure and ran it on iOS. Congratulations again for your code. I have implemented the demo project and it runs well on Android 8 SDK 26. Can you please explain why this app runs correctly without setting up notification channels which are required by Google? In the initialize method at line 33, and the channel is assigned to the notification at line 129. I have a plan to modify the code so that users can set up their own channels, however I have a bunch of other commitments at the moment. I’m having issues getting the app to work on iOS again, still using iOS 11.2. The app crashes on the startup, with the message “Couldn’t find Objective-C Class “UNUserNotificationCenter””. I tried resetting everything but the Delphi installation itself, meaning I reinstalled xCode, the Project is as clean as it comes and the SDK is also straight from the new xCode 9.2 (iOS 11.2) installation. Do you have any Idea how I could go about this problem? Greetings and thank you for all your amazing work, not just on the notifications. Hi Dave, thank you for the reply. After checking again and not finding anything I went searching for the “UNUserNotificationCenter”-Class. Apparently it’s only supported in iOS10+ Devices, while I was using a iOS 9.5 iPad because I temporarily did not have access to my up to date iPhone. So, completely my fault. It’s working on the iOS 12 iPhone. Thank you for your reply. Which parameters of the strings.xml file are used for FCM registration (get FCM token for Android)? I finally have FCM working on Android/iOS for my App using KastriFree thanks to your help and this forum. I do have a question however. How would I go about allowing a toggle within the application to allow or dis-allow push notifications? My guess since the device can receive notifications even when the app isn’t running is a call to de-register would need to be made. If that mechanism is Unsubscribing from a channel, what string value is supplied as the default channel? If I am incorrect, please point me in the right direction. That’s a good point, Mike; it would need changes to both the Delphi and Java code. I’ll add it to the to-do list. Hopefully I’ll be able to do something about it in the next couple of weeks. What ABSOLUTE changes would be required to move a (functional) app using KastriFree for notifications and permissions API26+ in the case the version of DELPHI moved from 10.2.3 to 10.3. I emphasize “ABSOLUTE ” only because I understand some items may be optional. 1 – Get latest version of Kastrifree from Github with 10.3 mods. My app when compiled for ANDROID on Rio 10.3… with NO changes asks for the permissions and hangs on a black screen. Before I dig into the code, I wanted to know what certain changes must be effected if you already have an idea. UPDATE: While I still would like to know any recommended ideas, my issue is not as it seemed. I was testing my App (ANDROID/IOS DATASNAP REST CLIENT) but failed to recompile the DATASNAP server app under 10.3. Apparently this step is necessary even with NO code changes. Firstly a big thanks to Dave for supply the Kastri libraries – it has proven to be an extremely useful library given some of the shortcomings befalling the Android stream. For reference the issues reported earlier by Fernando/Stanislav in regards to push notifications on Android not being processed properly with the apps in the background still persist on Android 8.0.0 & Delphi 10.3. Seems to work fine on earlier versions of Android but I am yet to test on a device running 8.1 but hopefully will do later today. Same issue occurs with supplied demo app and an updated app. I’ve tried all of the suggestions with no luck to date. If anyone has managed to work this one out it would be good to know how to resolve. My project has been fine over the last month or so with notifications working as expected. Last night I was preparing a release for The Google Playstore and somehow the project got corrupted. I put it back in order however, now on Android (still 8.0) using SDK 25.2.5, when the app is running, I do not receive the notifications. I do however get the payload in FCMMessageReceivedHandler. If I close the app, I get notifications just fine. Are you able to determine based on that what’s broken? Nevermind. Maybe I just didn’t notice all this time. I modified Line 138 of DW.Firebase.MessagingAndroid.pas so it behaves as it does on iOS. Is this by design that the notifications don’t work when the app is in the foreground? Thanks for your response. I am noticing that by removing the aforementioned condition on line 138 of [DW.Firebase.MessagingAndroid.pas], the app fires an empty Notification on startup. Is there any way to prevent that? Regarding showing notifications on Android when app is active. My resolution for this is to revert the last commit of line 138. In the ‘OnMessageReceived’ event of TFirebaseMessaging, create a TNotification (System.Notification) object (only Android, as iOS handles this itself). Create a NotificationCenter (I have a component on designtime) and add the own created notification to the NotificationCenter (NotificationCenter.PresentNotification(LNotification)). Note that you have to detect if the notification comes in while running the app, or if the notification comes in while the app was closed (so the notification starts the app). This change looks nice Dave, thanks! I’m still experiencing the Android 8.0 + exception when receiving messages when the app is closed (java.lang.ClassNotFoundException: Didn’t find class “com.google.firebase.messaging.R$string”). @Mike, have you solved this for yourself as stated in this blog on September 11, 2018 at 10:52 pm? It’s working on lower Android and iOS. But for a live solution I need to have support for Android 8.0 and higher as well. Current master repository of Kastrifree library. I’m sending JSon by my own server to https://fcm.googleapis.com/fcm/send. Using an Authorization:key in the headers and a ‘to:’ part in the JSon to send the message to a specific device. – send the channel ‘default’ with my JSon ‘notification’ object. I solved this issue by using DeployMan. There are way too many folders and file to specify a proper deployment configuration so you are likely missing some files. Look in the FCM Revisited posts and search for the keyword “Deployman”. Follow the associated instructions and your issue will likely be resolved. Let me know if you can’t track down the post. That’s would be great! I’ll keep you posted. The path from ThirdParty\playServices\Android\res need to be copied to the remote ./res folder and there are many files so deployman makes this simple. I think you will have success after that, but I’m willing to add any help I can. Unfortunately, I’m still experiencing the same problem. 01-07 09:14:56.621: W/FirebaseMessaging(13610): Missing Default Notification Channel metadata in AndroidManifest. Default value will be used. Even the demo project FCMRevisited does have this same error. So, only on my Samsumg Android 8.1 device. All Android devices I have with lower Android version are going fine.Only faulting when app is closed, so the service has to do it’s thing. Hi Dave, thank you for the response. Now finally I’ve figured something out now I knew it could work. The problem is in the JSon notification. I’ve added a ‘notification’-part to the message. This contains a body, title and sound (S[‘sound’] := ‘ default). I’ve introduced it to let the incoming message ‘beep’ as configured on the device. When I leave this ‘notification’ part away from my message, it suddenly works on Android 8.1! I’ll investigate a little further..
For the time being I will not send a ‘notification’ data-element in JSon anymore.I’ll first test if the current situation works well with my clients. For iOS however I had to re-enable the ‘notification’ data-element in the JSon to let the pushmessages come through. So my pushmessage-send-server will send a different JSon for iOS-registrered tokens comparing to Android registered tokens. Just asking out of curiosity what’s the gameplan for iOS come March 2019 with regard to FCM Support in KastriFree? I understand the Apple App Store requirement will be that SDK 12.x must be targeted. I haven’t had success beyond SDK 11.2 with the library. I’d like to plan properly since my current App store release is dependent on the library presently. thank you very much for the demo project. It works very well in general. I am using RAD Studio 10.3, my Android device is 7.1.1. I did all the configuration steps, the app is running and it receives a device token. The problem appears when I send a notification via Firebase Cloud Messaging to this device token. The app is being closed on the phone with a message ‘Unfortunately app has stopped’ (I hope this is the message in English – in German it says ‘App wurde beendet’). When the app is running in the background or the app has been closed the same thing happens. Do you have an idea where the problem is located? Great Demo, 10x a lot. Have a question, how did you get android Device ID ? As I know it is required for FCM initialization. 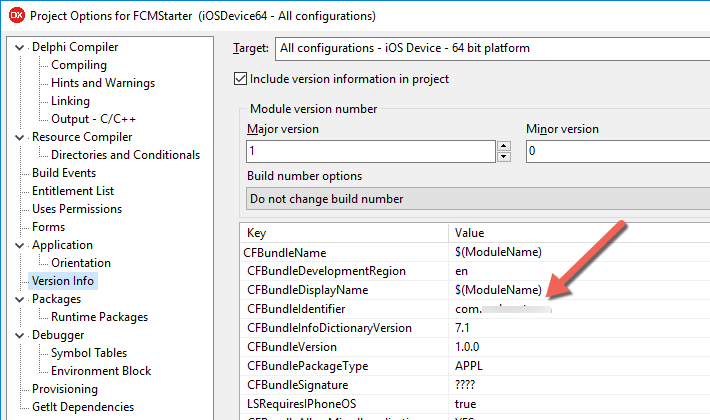 The Android device id is not required for FCM initialization. Perhaps you’re referring to the device token? That is all handled by the Firebase SDK for Android. Please note the warning in the source code, about the value returned. I used the FCM with this post on Delphi 10.3 well. but, now I upgraded delphi 10.3 to 10.3.1, I have a error message. I tested ‘FCMRevisited’ Demo project..
when the app is closed, is it possible to open Activity without clicking notification. It would be possible with further changes to the Java code (it is not something that can be done inside the Delphi code). I may have time to look at this in the next few days. I use FCMRevisited for push notification management and it works fine. Give me the news please. I modified the dw-firebase.jar file to include a launchintent. I’ll be looking at making this change anyway, however that’s excellent news! First of all thanks for sharing your work and keeping it up to date. I am trying to use push notifications it with Rio. KastriFree commit version is ce2b370 (yesterday). No problem with Android 8.0 and Android 8.1 version devices. However, I have a crash for Android 6.0 device that I cannot get a log (device is my friend’s). Device can receive push message when application has focus. Crashes when in the background. I also have a crash for Android 4.4.2 device. When app is in the foreground, push notification details shown in “FCM Messages” part in the memo. However, no push notification displayed on the phone. No log entries recorded for that, too. When in the background, crash reported and I read below log entries. 03-29 10:54:00.896: I/ActivityManager(2434): Process com.embarcadero.test (pid 23127) (adj 8) has died. I have not seen this error posted in all above comments so here it goes. This however does not couse application to crash. I’ve just pushed an update that should fix the issue. Unfortunately, at present I don’t have a device that I can test this on, so I’m “flying a little blind”. Problem solved. Android 4.4, Android 6.0.3, Android 8.0, Android 8.1 all can receive push notifications just fine. Both when app in the foreground or in the background. I seemingly having a problem when using push notifications and maps service together. As notification solution needs some libraries disabled in project, I get error when I create my form with TMapView and TLocationSensor components in it. Error message reads: java.lang.NoClassDefFoundError: Failed resolution of: Lcom/google/android/gms/common/internal/zzx;. I do not know if KastriFree includes MapView of its own. On the other hand, default MapView in Rio works out of the box. I have designed and coded my map related form in a separate app. That separate app is just fine and is running as expected with markings, circles and everything. Do you know if another map solution which can be used together with KastriFree? TMS has one as to my knowledge. I am not sure if its compatible though. I confirm that TMSFMXWebGMaps components run together with this push message solution just fine.